I heard many remarkable testimonials about Siberian Cedar nut oil, that it possesses curative, highly nutritional properties, and that it is rich in vitamins, amino acids, and minerals. Having once tried Siberian Cedar nut oil bearing the Ringing Cedars of Russia trademark, my family and I myself were unable to deprive ourselves from its continued use, it possesses such outstanding flavouring properties. Siberian Cedar nut oil can replace any vegetable oil, it improves the taste of a vegetable salad, giving it a refined, unusual appetizing aroma and colour, and its content of vitamin E and P exceeds that of olive oil by several times. It assists in the removal of heavy metal salts from the body, the lowering of bad cholesterol in the blood and raising good cholesterol because of its high concentration of the content of maximally unsaturated fats: oleic, gadoleic, linoleic, and linolenic. Since these acids are not synthesized in our body, products containing them should be present in a daily basis in our food allowance, which is especially important for children, and people having an increased weight and a high level of cholesterol in their blood. Siberian Cedar nut oil is a wonderful natural product, it is impossible to synthesize, and it is able to replace any biologically active additives and artificial vitamins. As a non-medicinal preparation, Siberian Cedar nut oil is widely used in therapeutic practice to help raise the intellectual and physical work capacity, to help eliminate chronic fatigue syndrome, as a supplementary remedy in the treatment of superficial gastritis, peptic ulcer of the duodenum and stomach, pancreatitis, and cholecystitis. It is useful for people suffering from allergic and skin diseases (neurodermite, psoriasis), baldness, increased brittleness of the hair, and fragility of the nails. It effectively helps regulate lipid metabolism. It is conducive to increasing hemoglobin in the blood. It is necessary to take one to two tablespoons of Siberian Cedar nut oil regularly two to three times a day, definitely on an empty stomach. The minimum duration of the treatment is 30 days, it is more effective to take the oil for two to three months. Siberian Cedar nut oil assists in restoring the strength of persons who have undergone surgical interventions, and heavy physical and psychological burdens and stresses. It helps promote an increase in the duration of productive life, and improve male potency. During the first month we took the oil, my husband and I began to notice that positive changes were occurring in our bodies: there was an improvement in our general well-being, vitality, and mood. I had the sensation that I had moved up to a higher energy level. It was pleasant for me as a woman that the condition of my skin, nails, and complexion had improved, even though, because of my large work load in the clinic and teaching activities at the university, I had no opportunity to visit a cosmetician regularly. 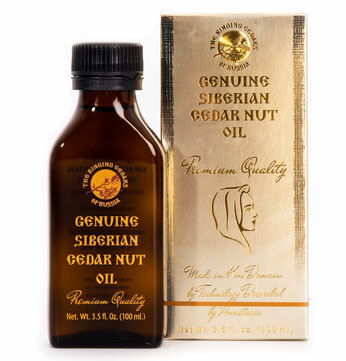 I will divulge my secret: if you place the warm Siberian Cedar nut oil on the skin of your face, upper chest, and hands for 30 to 40 minutes, you will quickly notice a splendid effect, one that is not provided by even one of the widely advertised creams of well known companies. Your skin becomes resilient, supple, and moist; the aging process begins to slow down. I always take Cedar nut oil with me to sea as a sunscreen, which protects the skin very well from drying and the unfavourable effect of ultraviolet rays. It is useful to place one or two drops of the oil into your nose for the night as a medicinal and prophylactic remedy in cases of pharyngitis, laryngitis, chronic rhinitis, acute respiratory illnesses, and influenza, especially for people living and working in unfavourable climatic and ecological conditions. I am an inhabitant of Siberia, where Siberian Cedars grow that have the richest composition in comparison to other areas of Cedar growth. I have the opportunity to obtain Cedar nut oil from various producers. I select the best Cedar oil produced under the Ringing Cedars of Russia trademark, without any fear of counterfeits or disappointment. I give my thanks to all those people who produce such a high quality, medicinal product that has the taste of the fresh Cedar nut. In the rehabilitation period of many neurological disorders, products are used that contain the irreplaceable fatty acids, vitamins, and trace elements necessary for the restoration of nervous tissue. Siberian Cedar nut oil bearing the Ringing Cedars of Russia trademark is a unique natural source of these substances. It is precisely in the structure of the nervous tissue that a high quantity of fats is present. Consequently, for the normal functioning of the nervous tissue and good elasticity (restoration) of cell membranes, it is necessary that the "proper" fats and fat-soluble vitamins enter the body. For example, the essential polyunsaturated fatty acids, linolenic and linoleic (omega 6, omega 3), and vitamins A, E, D. Siberian Cedar nut oil bearing the Ringing Cedars of Russia trademark contains the optimal proportion of these fats and vitamins. Thus, Cedar nut oil is prescribed in the restorative periods of vascular, traumatic, inflammatory, degenerative, and metabolic-dystrophic diseases of the central and peripheral nervous system. Together with chondroprotective agents, Siberian Cedar nut oil is prescribed in the rehabilitation of patients with pathology of the locomotor system (osteochondrosis, arthrosis).